Soorni, J., Kahrizi, D. (2015). Effect of Genotype, Explant Type and 2,4-D on Cell Dedifferentiation and Callus Induction in Cumin (Cuminum cyminum L.) Medicinal Plant. Journal of Applied Biotechnology Reports, 2(3), 265-270. Jahad Soorni; Danial Kahrizi. "Effect of Genotype, Explant Type and 2,4-D on Cell Dedifferentiation and Callus Induction in Cumin (Cuminum cyminum L.) Medicinal Plant". 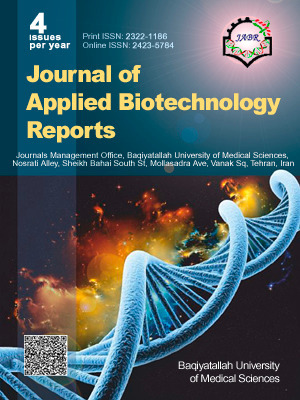 Journal of Applied Biotechnology Reports, 2, 3, 2015, 265-270. Soorni, J., Kahrizi, D. (2015). 'Effect of Genotype, Explant Type and 2,4-D on Cell Dedifferentiation and Callus Induction in Cumin (Cuminum cyminum L.) Medicinal Plant', Journal of Applied Biotechnology Reports, 2(3), pp. 265-270. Soorni, J., Kahrizi, D. Effect of Genotype, Explant Type and 2,4-D on Cell Dedifferentiation and Callus Induction in Cumin (Cuminum cyminum L.) Medicinal Plant. Journal of Applied Biotechnology Reports, 2015; 2(3): 265-270. Cumin (Cuminum cyminum L.), a member of the Apiaceae family, is one of the most important medicinal plants in the world. An experiment was conducted for the evaluation of callus induction optimization in cumin accessions from four different regions: Shahdad, Koohbanan, Badrood, and Afghanistan. A factorial experiment based on completely randomized design was conducted on MS medium supplemented with different concentrations of 2,4-D (0, 0.5, 1 and 2 mg/L) plus 0.1 mg/L Kinetin in different explants (Root, Shoot, Leaf, Embryo and Seed) of cumin accessions. In this experiment the evaluated traits were days to callus induction, callus induction percentage, and callus growth rate. Statistical analysis showed that seed (as the latest) and root (as the earliest) explants require 54 and 11 days for the initiation of callus induction, respectively. Results showed that accession, explant, accession × explant and 2,4-D × explant interactions had statistically significant effects (P<0.01) on callus induction percentage and callus growth rate. Furthermore, 2,4-D had a significant effect on callus induction percentage. According to the results of this study, in plants of some regions the root explant is an appropriate explant for large production of callus in some accessions of Cuminum cyminum. Also, Koohbananian accession produced callus in shorter time and the Afghanian one produced high number of callus.